Deep blue flowers are always popular in the garden and they don’t come more impressive than Agapanthus praecox ‘Torbay’. 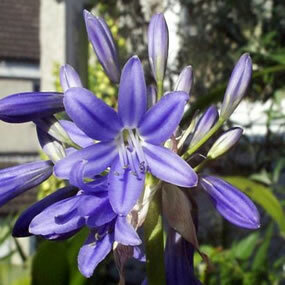 All six Agapanthus species are from South Africa and to grow well they need well drained soil and a sunny spot. Not all of the six species are fully hardy, which is why some are on display under glass here and some garden selections from the tenderer species are very popular in Australian and Californian gardens. With over 600 cultivated varieties available you need to be careful to pick one for home that has been bred for the British climate and which is reliably hardy. Agapanthus praecox ‘Torbay’ is a particularly dark blue and hardy form which looks great growing alongside Dierama and Phormium or mixed with grey leaved plants and grasses. Agapanthus means ‘love flower’ and who could resist falling for this late summer gem?